Well-known Toronto-based mezzo-soprano and performer, Ali Garrison and her highly esteemed colleague, Dr. Von H. Washington, Sr. (American theatre professional for forty years) are touring their latest and much anticipated theatre project, In Search of Giants. This production, about a personal journey leading to the discovery of three significant leaders on the Underground Railroad, has been playing to full houses and standing ovations since it began touring Michigan in November 2015. 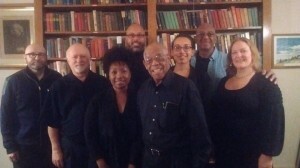 There have been numerous performances since, along Michigan and Ontario Underground Railroad routes, including Schoolcraft, Kalamazoo, Albion, Ypsilanti, Ann Arbor and Toronto. 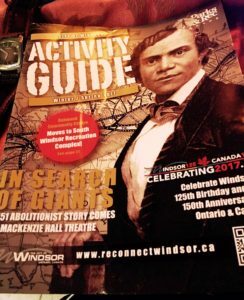 Next, on our Underground Railway Tour, In Search of Giants comes to Old Sandwich Town (now part of Windsor), Ontario, at the old courthouse, MacKenzie Hall on Saturday May 27th, 2017. In Search of Giants is a staged dramatic reading in the traditional style of the Afrikan Griot, but uses more than one storyteller. It features modern-day American storyteller, Dr. Von H. Washington Sr. The casts have also included the following American and Canadian performers: Ali Garrison, Von Washington, Jr., Michael Ray Helms, Romeo Phillips, Bianca Washington, Sharron Russell, Dwandra Lamkin, Tim Smith, Alicia Payne, Janai Travis, Duff MacDonald, Darryl Huggins, and Kwanza Msingwana. This entry was posted in Culture Building, Live Performance, Theatre Projects, Upcoming. Bookmark the permalink.